1) City farmer Wytze Nauta of Eemstadboerderij proudly harvested his first potatoes, pumpkins and sugar corn in the new district of Amersfoort (Vathorst). On 22 th of september inhabitants of Vathorst had the opportunity to harvest their own produce. People enjoyed local prepared pumpkin soup and children could take a ride on Wytze’s tractor. Wytze is now distributing his produce in Amersfoort. Several restaurants are using his potatoes. Both initiatives are good examples how fallow land in city development areas can be used in a productive and sustainable manner. 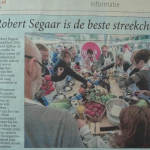 3) During the last seasonal market Smaak van de Streek in Amersfoort the first edition of Streekchef was held. Streekchef is a competition for citizens who like to cook and where invited to show their skills on preparing dishes with regional ingredients. In an open air cooking studio participants shopped their ingredients from the market and started to cook their dishes. 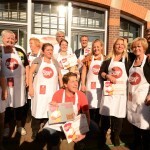 A professional jury of local cooks judged the results of the amateur cooks. 4) In november and december 2013 a small survey on logistics, supply and demand on regional food is planned. Restaurants, food shops, catering, farmers and producers will be questioned about several topics regarding use and logistics of regional produce. Early 2014 the results will be presented in a mini workshop for professional food entrepeneurs and farmers in Amersfoort. 5) Plans to start a ‘foodhub’ for regional produce in De Nieuwe Stad are now evaluated in a former Unilever toothpaste factory in the centre of Amersfoort. The main objectives of this initiative are to create an ‘easy access’ fysical location where citizens and food professionals like restaurants, food shops can buy regional produce. A good example to solve logistic problems regarding regional produce. 6) The initiative upsidedownumbrella has started in Amersfoort. Working together with local farmers and local producers all stages of sowing, growing, harvesting and producing can be experienced by children and employees of companies in several activities like a lunch box, school market, farm visits and workshops. 7) Finally, the main stakeholders of the Amersfoort Local Support Group ‘EEM’ are working together with city council deparments to establish a vision document on city farming.